The D-Link Xtreme N Desktop Adapter (DWA-552) is a 802.11n wireless client that delivers unrivaled wireless performance for your desktop computer. 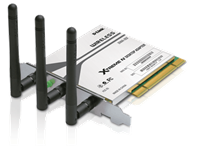 This wireless adapter delivers up to 14x faster speeds and 6x farther range than 802.11g while staying backward compatible with 802.11g networks. Once connected, you can share a high-speed Internet connection, photos, files, music, videos, printers, and storage. Access a secure wireless network using advanced WPA or WPA2 encryption. Easy to install and use with D-Link's new Quick Adapter Setup Wizard. ¤ Fixed: Wizard scan would be empty on utility's first run.